To those of you who are still willing to help me reach the goal of $2700 it’s not too late. This current time I have raised so far $1400 in which I am off setting the cost by charging the expenses and doing reimbursements as the donations continue to come in. I believe by faith that with your financial help that this goal will be met. I’ve been awake since 5:00am Thanksgiving morning preparing to leave and making sure my house was in order. My husband Brian drove both Bro. Steve Hackman and myself to the airport. Steve is on our Board Of Directors with Chosen 300 as well as a representative for Stephen’s Children, which is the organization that helps the children and families that are living amongst the trash dumps of Cairo. In total, the departure time to arrival time including the connection through London was about 20 hrs. I tried napping on the plane and was awakened every hr. by food that I couldn’t eat any more of. When we arrived in London, we found a lounge to sleep in taking advantage of the 10 hr. lay over. I wasn’t impatient, I was just anxious to get some sleep and then get to Africa. We met a couple in London by the name of Merck and Jane who where from New Jersey. They were going to visit their Children for 2 months who were living in Uganda. Mr. Merck shared with me on his goal to helping homeless individuals in his city of NJ and how he is having a rough time getting support as his church is being forced off the streets as if it is a crime to feed homeless. I shared with him our story and began to encourage him not to give up; which he was so grateful of the conversation and to get the boost that he needed to keep going. We boarded the plane from London to Egypt and met a young woman by the name of Theresa from New Hampshire but now living with her parents in Boston. She was off to see her boyfriend who was a native of Egypt. She mentioned that both families were uncomfortable with the relationship they have, as Theresa’s parents are Protestants and her boyfriend’s parents are Muslims. Steve and I shared with her what our purpose was for traveling to Egypt and she was really excited to here what we were doing and wanted to be able to volunteer with “Stephen’s Children” as she mentioned that she was looking to move to Egypt. 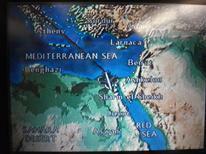 We finally landed in Cairo. Prior to our landing, I was looking on the screen at a moving map of our plane, which showed exactly where we were and all of our surroundings. I was in awe to see the “Red Sea”, “Damascus”, the Mediterranean Sea, “Jerusalem” and all the other countries and seas that we read about in the Bible. As I looked at the screen in motion it became more and more surreal to me to the point that I had to tell Steve Hackman to pinch me, so that I would awaken from this dream. We landed and the process was so smooth, unlike when my husband Brian and I were going through customs to Guyana it took quite some time. 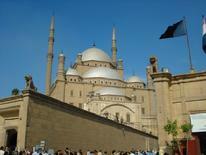 Here in Egypt we showed our passports and purchased a visa for $15, received our luggages, and we were on our way. Many workers at the airport wore ashes on their foreheads. I asked one of the guards what it represented and he said that it was a symbol of prayer. 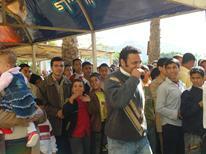 We were then accompanied by two representatives of “Stephens Children” which both of their names were “Emad”. They said that they wanted to make our lives easier. LOL. I thought that was cute. I called Brian to let him know that I had landed in Egypt and was ok. He was able to talk to bro. Emad who let him know that, “I was in their eyes” meaning that they were going to take good care of me. I know that this made Brian feel good to here. I later called back down to “Chosen 300” to greet the congregation of homeless and volunteers and gave the phone to Emad to greet in Arabic and English. I had to make the call while we were still in the van, because I could be in danger to acknowledge myself as a Christian and speak about Jesus in public. Both Emad’s are Christians and so is the organization of “Stephen’s Children”. However; we have to be discrete in spreading the gospel of Jesus Christ, as 83 percent of this nation is Muslim. I’ll tell you, for those of you who may not take advantage of the many chances that you could call on the name of Jesus do it. Take advantage! Take advantage! Take advantage! For it is a privilege to be able to worship our Lord and Savior Jesus Christ. No, I don’t like the idea of being careful and altering my language. No, I don’t like the idea of not being free to worship Jesus here in Cairo, but I understand my purpose for being here and will use the wisdom that God has placed in me to complete the mission that he has assigned me too. The love of Jesus WILL prevail. It was a very long day today, as I got up early to do some unpacking and found that all but 3 rice crispy treats that I had packed in my suitcase were missing and Bro. Steve mentioned that his bag was searched and a form was left in it letting him know that his bag was randomly selected. He said that he felt violated of his privacy, but had to deal with it. I had to quickly get ready for breakfast and really wasn’t that hungry, but we were meeting some others who came in on their flight that had already arrived at the hotel earlier yesterday. The hotel that I am staying in shows the Nile River right outside of my window and I can’t help but think on how that water was once blood with all the other seas, rivers, and streams of Egypt when the plague was put on the land because of Pharaoh and the hardening of his heart not to free the children of Egypt. Even when a little lad was found by an Egyptian woman in the Nile River and named him Moses. This is what I am going to be seeing out side my hotel window every day that I am here. Remarkable! I went to breakfast and the food was very tasty, but just as I was done eating, I began to break out in hives all over my arms and stomach and it was spreading fast, so Jenna who is one of the people traveling with us (whose father is on the Board Of Directors of Stephens Children) had packed a first aid kit and gave to me Benedryl cream as well as a Claritin table to take before my hives spread anymore. Thanks Jenna you’re a skin saver. We were then picked up by a woman named Ammee, who took us to a national military museum that educated us about the origin of King Mohammed Ali Pasha, which was very formative. As we were getting out of the van there were children all over the place who wanted to shake my hand and say hello and learn all about me. Many of them knew very few words in English, but continued to smile and shake my hand. There was a little girl that kept taping me to get my attention out of the crowd and when I turned to her, she would run behind her mother. Finally, she came to hug me with a big smile. I asked Ammee if this was normal for the children to be drawn to me the way that they were and she said that many of them live in the villages and has not ever seen foreigners before, but Steve Hackman had been to Egypt four times and has taken the same tour and from his prior experiences he has never seen anything like it. He said that the children that are living amongst the trash dumps are very friendly and always come running to you, but this is the first time that this has happened in an opened city from his experience. There were also many other people in this location who were American foreigners and they could have easily gone in their direction. 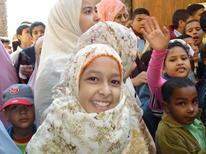 Wherever we went children surrounded us; beautiful Egyptian children. We entered the exhibit of the Mosque, it was mandatory to take off our shoes as many came to still pray to their God and it was considered holy. Even inside the Mosque children came from their locations to come and greet us, it was an amazing how the love of Jesus Christ shined even in the mist of a fully Islamic community of people. We then went to a Christian Church to learn about the Coptic Christians, which is another word for protestant. This was also informative; I took a lot of notes. Did you know that when Pharaoh ordered all male Children to be killed, that is when Mary fled into Egypt and lodge with Jesus in 14 different locations? We went to one of the churches that she stay for 3 weeks and nothing has been touch since that time. We went to lunch afterwards and I really didn’t want to take the risk of breaking out again so I had French fries, string beans and carrots. David who attends Branch Creek Community Church just flew in today and was waiting at the airport for over 2 hrs before they found him. We had a little scare. He was finally picked up and we were all relieved that he was safe and able to join us for lunch. We went back to the hotel to get some rest because later that evening we would be picked up to have dinner with mama Maggie’s (Director of Stephen’s Children) family and staff. I met a lot of beautiful people whose names were Mai Jane, Mary, Summer, Abraham (Sis Maggie’s husband) and her mother. Everyone got the chance to fellowship with each other before we traveled into the city of Cairo to help the children living amongst the trash. This will take place on Monday. Gotta get some shut eye, I have a long day tomorrow. This day was a day that I never thought I would experience and that is over sleeping and waking up 5 minutes before I was to be picked up in the lobby. All I can tell you is that I used a toothbrush & toothpaste, so that was going to have to be good enough. I am normally a very early riser as you may have read earlier in my blog, but this 7 hr. difference has really got my body struggling on this new time clock. Today we went we traveled to the pyramids and to my surprise there was a lot of poverty awaiting us when we got there. There were people doing everything they could to convince you to give them money, whether it is by them pointing you in the direction that you want to go. (Pay me), they showed themselves aggressive to try and make you give to them for any reason at all. Here nothing is free. Bro. Steve was walking with David and snuck a picture of a little girl and her mother caught up with her to try and make him pay for the picture. Steve almost gave in. David purchased from the woman, which off set the damage that Steve had done. We had established not to give money or take any money from the people no matter how much they tried to pressure us. Of course this means that David felled the test. The little 7 yr old Egyptian girl was very wise, she looked to be about 4 years old, but she said that she was 7 years old. In her Arabic she said that she didn’t want her mother to have the money and to give it to her. She also said that she hated her mother and wanted her to go to hell. This little girl had already established in her mine that her mother was using her to get money and was leaving her to struggle. Before leaving, I went back to the pyramids to find rocks and alabaster stones to take back with me to the US. The woman and child caught up to me again to try and convince me that her daughter had fallen down on the rock and hurt herself, but could not tell me so she tried demonstrating what had allegedly happened. The young girl had tears that may have seemed real to someone who was very passive to fall for it, but I was ahead of the game by giving everything I had (purse & camera) to Jenna prior to returning to the pyramids. That way I knew that I would not have to be challenged to give. I told the mother who understood a little English that as a mother it was important for her to take care of her child and I told her that God would help her, to be strong and I would be praying for her. She said thank you. I shook her hand and discreetly said a very short prayer in the name of Jesus. Both mother and child were homeless living by the pyramids waiting for people to come so that they could beg for money just like any other homeless person whether in the US or the UK. When David went to give her an Egyptian pounds (10EP) ($2US) she wouldn’t accept it. Finally she accepted (20EP)($4US). Bro. Steve came to tell me that we needed to get back before the guards came to see me picking up rocks. I have been successful day after day to pray for the people of Egypt. Continue to intercede for me as I work diligently to complete the assignment set before me. This was a very emotional day for me. A little hard to digest this reality that I have faced Today from 8:00am this morning until 9:30pm this evening. This was none stop. I have to mention my challenge to not be able to where my chosen 300 T-shirt when I went to the trash dumps because of the symbol of the cross embroidery, but as I got up this morning I knew that I would need to rap my hair and so I used the very shirt that I was told not to where as a shirt because of its Christian emblem and rapped it around my head, which means that I still got the chance to wear my Christian T-shirt as a head rap. We met in the lobby and exited by two’s, as this was the process that I can’t further discuss, however; our first stop was to the trash dumps in which the children and families live. I don’t really know how to explain to you what has happened to me, but I will say that it has changed my life. Just when I thought I had seen poverty, just when I thought I had been exposed to homelessness, God is saying in my heart, more help is needed, and it is time to get to work right were you are. I am too emotionally drained and think that I can be more effective writing to you tomorrow. Please continue to pray for me. There is just not enough time in a day to write my blog. I still have so much to write about. At this time I am prepare to leave in 15 minutes to the airport for Abuja Nigeria. I am not confident about the Internet service there on whether I’ll have access or not, But I will continue to write offline. I know that Brian sent out a bulk email of the pictures so that everyone can see. If you did not get them please email him at chosen300@verizon.net. I have to say briefly that when looking at the pictures, keep in mind that the children that you are looking at in the schools are many of the children that are continually being rescued from the trash dump area. I met the little girl who the director mom Maggie was holding in the brochure for “Stephen’s Children” she was a very small child at the time. She is one of the girls at the orphanage that I met and she looks amazing. There is so much help needed here and I know that God sent me all the way to Egypt just for this purpose. I am awaiting what work is needed in Nigeria. I would like to acknowledge my Mr. Mom, My husband who is doing excellent with my boys David and Jonathan. I knew he could do it! Thanks for everyone’s prayer during this process for my family, it isn’t easy but because God called for this mission is helping us make it through.